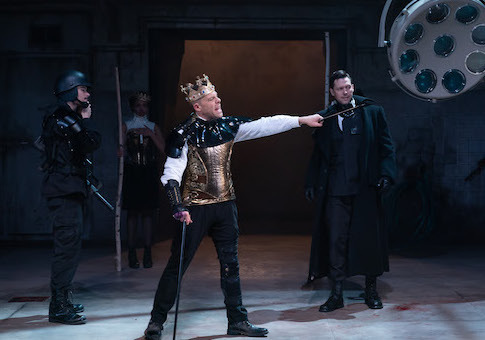 The Shakespeare Theatre in Washington, D.C., just closed its production of Richard III this week—but not before opening it to a host of revisions intended to promote the tragedy's "parallels to the contemporary moment." That moment is, of course, the presidency of Donald Trump and the chief parallel is that, like Trump, Shakespeare's Richard is, as director David Muse puts it, "a heartless man, a con artist, a man obsessed with winning and power, a misogynist, a spinner of news and misinformation, a man who thrives by beating others, a man who uses and discards people." That description certainly fits Shakespeare's Richard—the Bard is not too kind to the last of the Plantagenets. From Richard's famous opening quip, "Now is the winter of our discontent," to his equally famous final lament, "My horse, my horse, my kingdom for a horse," Richard is the mirror of Machiavellian kingship. He slaughters his adversaries as he claws his way to the English throne, and once securing it, guards it jealously by murdering those who helped him get there. When, in the end, Richard gets his comeuppance, his replacement Edmund, Earl of Richmond (later Henry VII, progenitor of the Tudor dynasty), repeats the cycle. And it's great fun to watch. One of Shakespeare first great villains, Richard is a captivating rogue, and yet almost completely inhuman. It's a schema Shakespeare later used handily in crafting Macbeth, and triumphed in with his finest creation, Hal, the tortured Machiavellian hero of his Henriad tetralogy. Muse recognizes Richard's seductive humor, as does his lead Matthew Rauch, who plays the wicked king as a flippant cad. And the play's staging reflects this understanding, too. Muse sets the War of the Roses in dystopian 15th century England, on a set resembling that of 12 Monkeys with a grinding guitar soundtrack. For those who have slogged through old Olivier adaptations, it's oddly refreshing. Muse makes mostly light touches: All the courtiers wore too-big suits and too-long ties. The actor who plays Buckingham, the lord who places Richard on the throne before the king humiliates and savagely murders him, bears a striking physical resemblance to Chris Christie. There are a couple lines, too, that Muse emphasizes to stress the contemporary nature of the production, such as Buckingham's quip about the princes whom Richard locks in the Tower of London: "Oft I have heard of sanctuary men, but sanctuary children ne'er til now." This is not the first time a director has repurposed Richard III (or any Shakespeare drama for that matter) to score political points. The play enjoyed great popularity in the theaters of Richmond, Va., during the American Civil War, where it was staged more than 100 times. The role of Richmond is how John Wilkes Booth made his name, and—had he not shot for brighter stars—his renowned performances might have been his lasting claim to fame. And no wonder: Southerners interpreted the play to be an allegory. In their eyes, President Abraham Lincoln was as deformed as Richard—a monstrous upstart bent on murdering his country's best sons. The fact that the play's savior, Richmond, bore the same name as the Confederacy's capital only emboldened Southern rereadings of the play. Richmond also plays a key role in Muse's reimagination of Richard III. As he sees it, the way Richmond responds to Richard is much like the resistance to our leadership today. "It's [the play] about how a country responds to a leader like this. We watch people negotiate with their own mortality, align themselves with power and resist secretly if at all," Muse writes in the program notes. "It's about the inescapable magnetism of a certain brand of vileness, our inability to resist being drawn in, the danger of manipulation on a massive scale." And so, when Richmond the liberator steps on the stage, it's only natural that he should be … a woman, clad in the jungle garb of a Sandinista rebel. The play flattens out immediately. This is no longer a story about the struggles of an evil king in a complex society. It's the old battle of the sexes, where the flagrant woman stomps out the overbearing man. And Muse isn't afraid to hit us over the head with the message. His Richmond, Evelyn Spahr, delivers every line with the bravado of an Amazon and, in defiance of Richard's designs on the throne, forges a lesbian marriage with the daughter of the deceased King Edward IV. As the resistance prepares to do battle with Richard, she stands on the shoulders of her men and addresses the audience in an empowered rebuke of the tyrant. It's not as if Shakespeare needs an update to accommodate girl power. Cymbeline and Twelfth Night present both comic and dramatic gender swaps. King Lear gives us Cordelia, the most heroic of women. And The Tempest's Miranda is truly to be wondered at. But even through all the revisions, Shakespeare's original Richard III speaks: His work is universally relevant, no matter the political "moment." When directors narrow his work to the present moment with updates, they betray their distrust for audiences to see his lasting mastery. It makes you wonder who's the real tyrant.